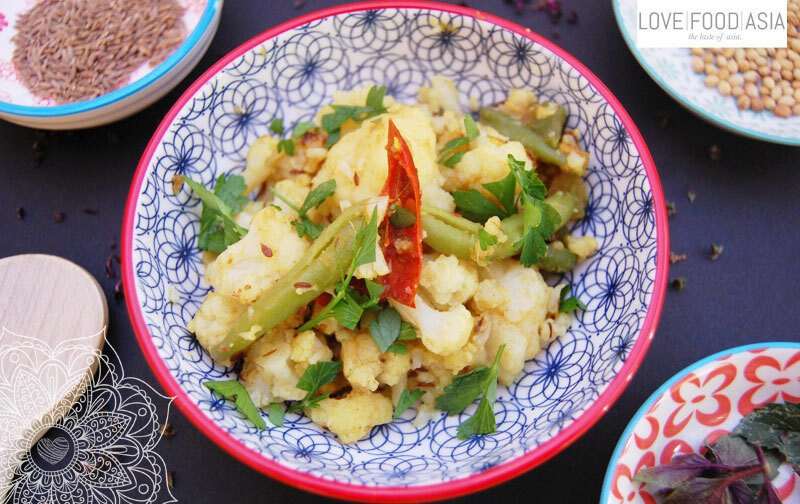 Aloo gobi or Indian style potato and cauliflower is a brilliant side dish for your favourite curry or brilliant as a starter; it’s vibrant and delicious. You also can serve this Basic Indian dish with roti or rice to have a filling main dish. To get a wet masala mixture mix Ginger-Garlic Paste, coriander, asafoetida, turmeric, and half of the water in a small bowl and set aside. In a large pot, warm oil over medium-high heat until shimmering but not smoking. Add chilis and cumin seeds and fry for 1 minute. Add wet masala and cook until the paste thickens. Now add potatoes, stirring to coat with the masala. Season with salt and add the rest of water. Cover and and simmer gently until the potatoes are just cooked. Remove lid, stir in cauliflower florets and beans and cook over a gentle heat until everything is cooked and soft, and the liquid has reduced Garnish with fresh coriander / cilantro and sprinkle with coconut flakes and serve. A perfect side dish to Aloo Gobi is our Roti Prata!